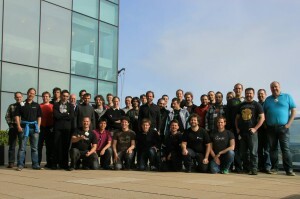 After almost a week in Dublin, we’re back with a debrief of the Xen Hackathon. Please note this is from our point of view (Xen Orchestra team) and that we’re not kernel or hypervisor hackers. One of thing that was very interesting was that a lot of people who are doing Open Source software here were paid by -very- big companies (Google, Oracle, Citrix, etc.). We felt very small comparatively, but at the Hackathon, people were not “representing” a company. You’re just a hacker working on a project. In my opinion, that’s the magic of Free and Open Source Software: everyone can contribute, there is no bureaucracy or hierarchy. If your project responds to a need, you’ll have people around you, no matter where you from. We felt the Bazaar model was very present at this event. To ensure good participation and collaboration in the sessions, Lars put stickers on the window. Each table was identified with a number. You just have to fill a sticker and put it at the right place and you could find people working an a specific project. Simple and efficient! It was just a tool, to find people, connect and guide discussions. The Hackathon was really informal, and that’s why it was great. You can talk to everyone, get views, advice and ideas from everyone. But we needed the sticker framework to start, because many people didn’t know each other. For example, our first conversation about Xen Orchestra was with Andrew Cooper. We talked to him because he sent us a patch a few weeks ago. He uses our software, and he had some great feedback for us. After few hours, we managed to fix those bugs. We also discovered that Xen Orchestra is pretty scalable, because it was tested with numerous hosts and Vms. Thanks you to Andrew for the feedback. The other good thing at the Hackathon were unexpected ideas from people working on something completely different. An example was a conversation with Boris Ostrovsky from Oracle. After seeing our molecule view, he asked if we can build a XAPI based system in Xen Orchestra using drag and drop. A real challenge, but a really exciting idea. 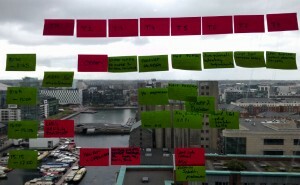 Session organization, with Dublin in background. Time flies. By Thursday evening the Hackathon wasn’t yet over. Lars took out everybody (40!) 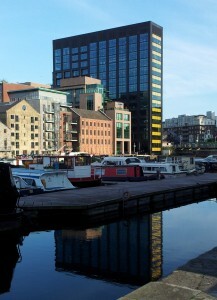 to a very nice restaurant, not far from Google Docks. We drank a beer first: another opportunity to talk with people. The wine and food was great (I never tasted a Gran Sasso before, thanks Dario 😉 ). But it was a little harder to participate in a conversation because of the noise. Clearly normal with a lot of people! The dinner was a great way to build relationships with people and get to know them, beyond the technical work happening at the Hackathon. I admit we were very exhausted at around 11pm and we decide to go to sleep to recover. Indeed, the next day was very intense. This Hackathon was a mix of a good place, good people and good organization at the same time. This kind of combination allowed a lot of discussions, exchange of viewpoints, spontaneous creativity and a better understanding of the Xen Project as a whole. If the objective is “to give developers the opportunity […] to collaborate with other developers as well as allowing everyone to put names with faces”, I think we can say: mission accomplished!Â For the Xen Orchestra project, I can already say that it will give us a lot of thing to process: it was far beyond our expectations. We would like to thank everybody there, especially Guido for making it possible and Lars for coordinating people, which is not trivial when you are 40. Also thank to those companies believing in Open Source community, allows us to meet despite our geographical distribution.